The summer and fall months are for playing, traveling and being outdoors before winter sets in. We are constantly jetting in and out of our home for weddings, vacations, trips with friends or work travel. The packing, re-packing, laundry and the desire to have a stocked fridge haunt the “pre-trip to-do list.” In order to help you make the post-trip transition a lot easier, add these three simple tasks to your pre-trip regime. When you can transition back from a trip with ease, you reduce the pain of a vacation hangover and can enter into your workweek feeling more grounded and energized. There is nothing better then coming home from traveling or camping and jumping into your clean, comfortable bed. 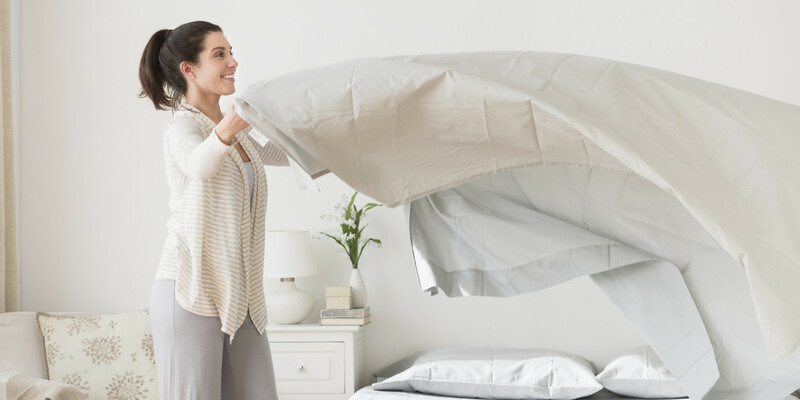 Make an effort to wash your sheets before you leave so you can transition back into your routine with more ease and comfort. Instead of laundry becoming another “to-do” on your list, multi-task while you pack. If you end up having to stay up a bit longer because you are waiting for the sheets to dry, don’t fret. The wait will be oh so worth it when you return from your trip to a great night’s sleep. I am a huge fan and believer in knowing what is stocked in your fridge at all times, but especially when you are leaving town for more than two nights. Make sure to clean out your fridge and discard anything that might go rancid while you are gone. There is nothing worse than coming home to a smelly fridge that has no edible food. Also, a pro tip is to make sure there is some food that will stay fresh in the fridge while you are gone so that you can come home and have something to munch on in case of a hanger attack. For instance, unopened turkey meat, canned tuna fish, a box of lettuce will usually last a week, eggs, carrots or even cabbage. You can also freeze most forms of leftovers lingering in your fridge so you don’t have to feel guilty for wasting food. The important thing is to ditch anything questionable so you don’t have a rude odor welcoming you home. Before leaving for a trip, try to tidy up and remove scraps of paper, mail, notes, books etc that you find laying around on tabletops or shelves. It doesn’t have to be a deep clean, but 10 minutes of organization can go a long way. Removing the clutter will create a more fluid, creative and welcoming vibe when you return home. When your space is clear, all you will need to focus on is unpacking your bag and doing laundry versus thinking: “oh boy, I have to clean all of this up in addition to laundry and feeling unorganized for my work-week ahead.” If you just don’t have the time to actually deal with each item, throw them all into a single box or pile that you can deal with when you get home. Home should be a place you want to return to. Mindfully planning ahead helps you make yourself a priority so you can breathe easier. Give your space some love and attention before you leave with these simple tips so that you are welcomed back into your home with open arms. Older PostWhat to Harvest Vs. Let go?